"Would you rather?" is one of those games that my best friend Shoush and I would play whenever we were bored or stuck in traffic on our way home from uni. 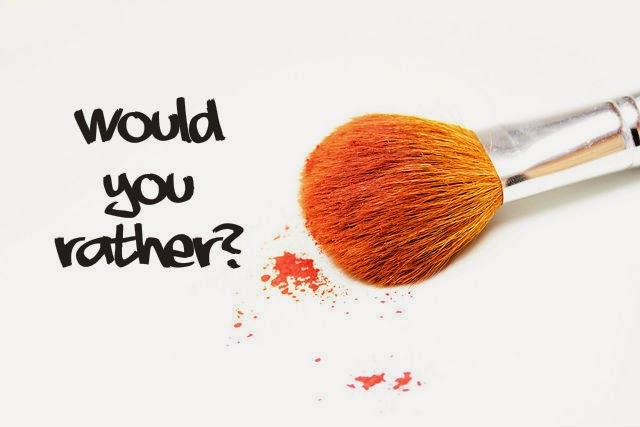 Our version of the game usually involved boys and awkward situations which I won't get into in public on the blog, but I will get into the Would You Rather makeup tag. Maya from Playing With Fashion tagged me to do this a loooooongggg while ago, but I was kind of in a blogging funk when she did so I didn't do it then. While stalking her blog today, I stumbled upon the post and thought that I should finally do it! 1. Would you rather lose all your mascaras, eyeliners, lipsticks and lip glosses or lose all of your palettes and eye-shadows? Did Satan write this question!? I love my mascaras more than anything in the word, in super close second place are my eye-shadows. Eyeliner, lipstick, lip gloss.. I can live without them. For the sheer logic I'm going to say I'd rather NOT lose my eye-shadows because they're more expensive and hard to replace... versus lipstick and mascara which can very easily be replaced with a trip to the drugstore. Coral all the way!!! I think I only own one pink(ish) blush. 4. If you had 1,000$ to spend, would you rather buy clothes or makeup? I don't think I've reached that level of makeup junkiness to want to spend a thousand dollars on makeup... so the only sane decision is clothes and shoes, naturally. Would you rather fight 1 horse-sized duck or 100 duck-sized horses? I guess I'd go with the horses... or the eyeliner as lipstick? 7. Would you rather only use one eye-shadow color or one lip color for the rest of your life? 8. Would you rather wear winter clothes in the summer or summer clothes in winter? I do sometimes wear summer clothes in winter... but with tights, socks, boots, cardigan, gloves and a coat... does that count? But all that in summer.. I'd have a heat stroke! Dark nails, because I'm emo like that. Give up my Revlon "Crush Begun" and Rimmel Koss Moss in 12 or give up my Naked Palette? Hmm... the only reason I'm going with the Naked Palette is because I feel like there are a ton of similar products right now. Also because I hate finding the right shade of lipstick, and the Revlon one is the perfect plumy purple and the Rimmel is the perfect reddish coral! Never use lip gloss... I kinda hate lip gloss. Plus painting my nails is my therapy, if I stopped doing that I'd probably murder people... we don't want that to happen now do we? 13. Would you rather shave your eyebrows and have non at all or Sharpie then in everyday? My eyebrows look like they're Sharpied in anyway because they're so black, so I'm going to go with Sharpie? I take my earlier statement back, THIS question is asked by Satan! What!? No nail polish!? No makeup!? If I never had to look myself in the mirror I guess I'd go with no makeup? But if not, then I guess it would be no nail polish... I don't know, this is a depressing question. So what would YOUR answers be? Okay so Imma start.. This is harder than I thought! 12. Euuh, who uses lip gloss anyway :/? 1. I'm not an eyeshadow person. Liquid eyeliner is my thing. 2. I don't remember the last time I cut my hair and I'm probably never cutting it anyway! 3. I'm very white so pink for sure. 7. I'd say 1 eyeshadow color. 9. Dark all the way. All my life I've never had bright nails for more than 4 days..
10. I'd never give up my dark red lipstick, go away. 11. Big ears = no ponytail! Plus, messy buns are the best thing ever! 14. I'd give up nail polish..
7. Use one eye shadow color and beige!! 8. Summer clothes in winter!